At the VRLA (Virtual Reality Los Angeles) expo, AMD demoed their upcoming Dual Fiji based Radeon R9 Fury X2 graphics card. 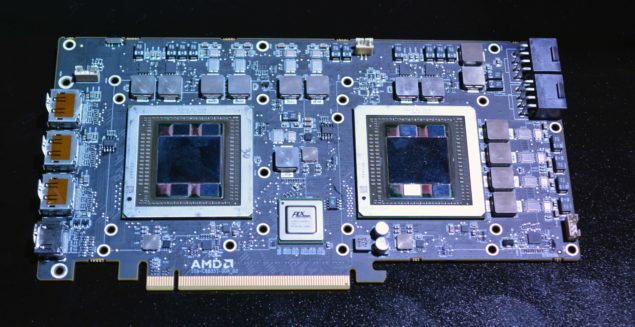 The Dual Fiji based graphics card will be the fastest card that AMD have produced yet, based on their Fiji graphics core which is found on the Radeon R9 Fury series and the Radeon R9 Nano cards. The Radeon R9 Fury X2 was showcased inside a prototype system made by custom PC maker, Falcon Northwest, powering Virtual Reality demos at the expo. The AMD Radeon R9 Fury X2 was displayed back at the PCGamer’s E3 event where the partnered with AMD to showcase their latest graphics processors. AMD’s CEO, Lisa Su, surprised the audience by giving a first glimpse at the Dual Fiji based graphics card and the card was expected to launch sometime in Autumn of 2015 however the card was delayed to early 2016 to better align it with the Virtual Reality market and availability of the HMD (Head Mounted Display) products such as Oculus Rift and HTC Vive. The AMD Radeon R9 Fury X2 will be the fastest graphics card in the AMD graphics lineup when launched. The more demanding VR experiences will require more beefier graphics cards and the Dual Fiji product is one that will be able to handle them adequately. The graphics card will pack two full Fiji XT chips, each featuring 4096 stream processors that round up to a total of 8192 stream processors. There are a total of 128 raster operation units (64 per GPU) and 512 texture mapping units (256 per GPU) on board the Fiji GPUs. Each core is expected to clock up to 1000 MHz however, we might see the aggressive clock technology that’s featured on the Radeon R9 Nano to put out better efficiency. The dual Fiji dies will incorporate 4 GB of HBM VRAM each, stacked on the interposer that will be operating along a 4096-bit bus interface and clocked at 500 MHz to put out a total of 512 GB/s bandwidth per graphics core or 1 TB/s from the full board. The card is expected to feature a TDP of 375W which has been the case since several generation of dual-chip cards and will be cooled by a liquid cooler as hinted before. The Radeon R9 Fury X2 will be the last of the Fury series cards after which AMD will unleash their Polaris GPU architecture on which several next generation graphics cards will be built. 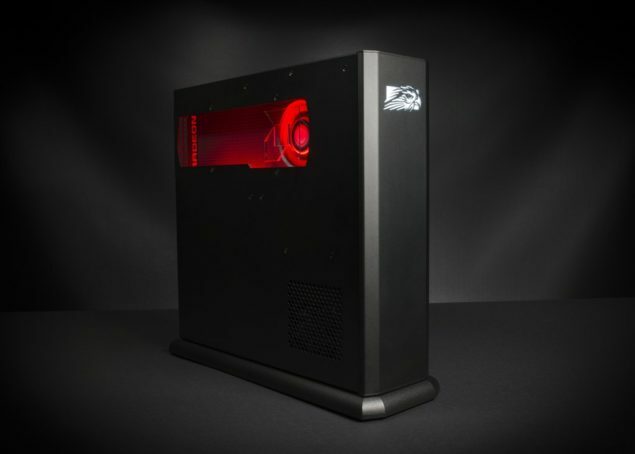 The new graphics cards will have a bigger focus on technologies powering Virtual Reality and Augmented Reality which will demand more power from gaming PCs. Both AMD and NVIDIA will be offering great products and driver support to power these VR experiences.